In good times or bad, income investors can rely upon Johnson & Johnson, Procter & Gamble, and Sherwin-Williams shining through. One of the benefits of dividend investing is the comfort that comes from the regular income stream. But market downturns can many times throw that sense of security out the window. What income investors need are dividend stocks that can also thrive in bear markets. We asked three Motley Fool investors to highlight a stock that can thrive in good times and bad. See why Johnson & Johnson (NYSE:JNJ), Procter & Gamble (NYSE:PG), and Sherwin-Williams (NYSE:SHW) may be poised to perform in bear markets. Keith Speights (Johnson & Johnson): I liked one of the internet memes going around recently that said the eclipse would go blind if it stared at Chuck Norris. Johnson & Johnson might not be as tough as Chuck Norris is purported to be, but this healthcare giant can withstand a lot and keep on going. Any time is a good time to own J&J stock. One way to know how a stock might perform in a bear market is to look at how it fared in the last bear market. In 2008, for example, Johnson & Johnson stock fell around 9% for the year. Granted, shares dropped more from the high level in 2008. However, J&J still outperformed most stocks on the market. It's important to understand why that was true then -- and why it should be the case in the next bear market, whenever it comes. One reason is Johnson & Johnson's solid dividend. During rough times, dividends can be the only positive thing going for investors. It only makes sense that strong dividend stocks like J&J, which has increased its dividend for a remarkable 55 years in a row, would be attractive during a downturn. Another key reason for J&J's strength during a storm is the nature of its products. People won't quit buying Tylenol and baby shampoo because the stock market is falling. Cancer patients won't stop taking J&J's Imbruvica during a bear market. Johnson & Johnson's share price might decline during the next major market correction, but it should perform better than most and will undoubtedly bounce back. Keith Noonan (Procter & Gamble): If you're looking for stocks that are likely to be resilient in a bear market, consumer staples companies are a great place to start. Bear markets are typically accompanied by more cautious consumer spending habits, and selecting companies that deal in products with demand that's likely to remain relatively steady even as purse strings tighten is a good way insulate your portfolio against a downturn. Brand strength also tends to be a big advantage during bear markets because it keeps customers coming back and helps companies maintain pricing power. With a product catalog that includes Colgate toothpaste, Speed Stick deodorant, Ajax cleaning products, and more than 20 other billion-dollar brands, I think Colgate-Palmolive stands out as a great stock for beating the bear market. 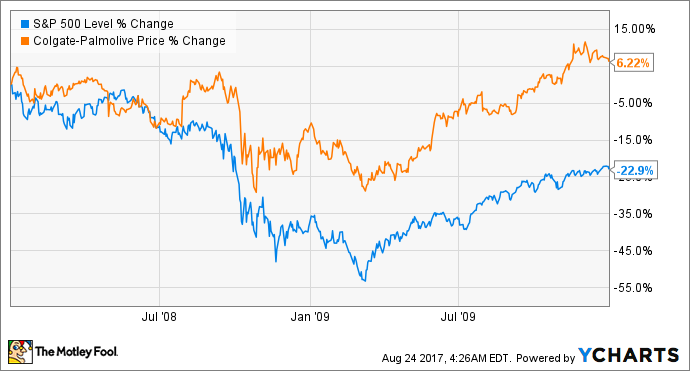 As the chart above shows, Colgate-Palmolive dramatically outperformed the S&P 500 index during the 2008-2009 recession. Past performance doesn't guarantee that the stock will thrive in the next bear market, but its product catalog, improving margins, and returned income component suggest it stands a good chance of remaining sturdy when turbulence hits the broader market. The stock packs a roughly 2.3% dividend yield, which might not be huge, but it's still comfortably above the S&P 500's yield of 1.9%, and continued payout growth appears to be a safe bet. Colgate has delivered annual payout increases for 60 years running, and the forward cost of distributing its current dividend represents just 55% of trailing earning and 56% of trailing free cash flow, so the company's dividend legacy should only get better from here on out. Rich Duprey (Sherwin-Williams): Paint doesn't seem to be something that should be particularly impervious to bear markets, but because a can is one of the simplest and cheapest ways to spruce up a home, it makes for an ideal investment in a market downturn, and Sherwin-Williams is one paint and coverings specialist all investors should take note of. 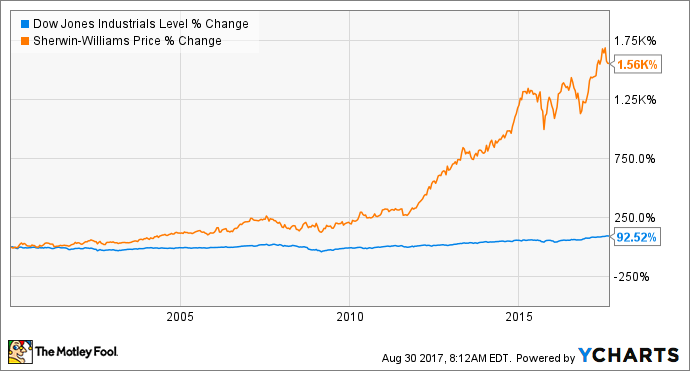 Sherwin-Williams has returned over 18% annually for the past 15 years, and since 2000, it has returned over 1,560%. Not bad for a period that includes both the Tech Wreck and the Great Recession. In comparison, the S&P 500 has returned less than 93% over the past 17 years. The reasoning is simple: When times are good, Sherwin-Williams benefits from the construction boom that typically follows, while hard times, as noted above, have customers hunkering down and sprucing up what they already own. As the world's largest paint and coverings specialist following its purchase of rival Valspar, Sherwin-Williams now also has geographic diversity. Heretofore, it generated some 84% of its revenues from domestic markets; Valspar brings with it almost half of its $4.4 billion in annual revenues from international markets, mainly China, where it realizes 12% of its sales, and Australia, which accounts for another 7%. Sherwin-Williams has raised its dividend every year since 1979, making it part of the exclusive club of stocks known as Dividend Aristocrats, or companies that have hiked their payouts for 25 years or more. While the $3.40 per share dividend currently only yields 1% annually, investors also have the peace of mind of knowing that even in a bear market, the stock will hold up, and the payout will be secure.